Discussions of nuclear proliferation are tainted by some fundamental problems. Some academic "nuclear proliferation experts" appear to be unable to distinguish between nuclear weapons and nuclear devices. There are important differences. A nuclear weapon is deliverable by military means. That is it is possible to place a nuclear weapon at a particular spot and at a particular time, with a reasonable assurance that it will do what it is intended to do. A weapon must be storable, without short term deterioration. Finally a weapon should not kill the people who manufacture or handel it primary to delivery. A nuclear device on the other hand may be too heavy to deliver by conventional military means. Thus a device can be designed with radiation shielding materials that would be too heavy to use in a conventional nuclear weapon. A device may be constructed from material that immediately begins to damage parts of the device. A device might require immediate use in order to be effective. A device could be constructed in a special laboratory, which could be equipped with expensive and difficult to design and manufacture equipment intended to protect workers from high levels of radiation from fissionable and associated materials. Thus a device could contain materials that would be considered militarily useless or worse in a weapon. connection between power production and military application. . . . there is a great and increasing need for fissionable materials in the military field. It seems to be doubtful whether, on the basis of present technology, atomic energy can produce power in an economically profitable manner. Power production can, however, be conducted in such a manner as to produce militarily useful materials. It would seem to me reasonable to stimulate the construction of power-producing reactors by guaranteeing a price at which the Government will buy the militarily useful by-products. This price should of course be set lower than the price at which the Atomic Energy Commission is producing fissionable materials at the present time. In fact both and Cole knew that this plan had not originated with Teller, in fact it had its origins in the United Kingdom. During the 1950's and 1960's the militant British Coal Miners Union, was a thorn in the flesh of the British Government, the British Economy, and the British public. Electrical power generation in the UK was dependent of coal mined by union miners, and thus the possibility existed that the British ability to generate electric power would be lost in the event of a long coal miners strike. Thus the British government proposed to build the Calder Hall Magnox Reactors the ability to generate electricity. The catch was that electricity produced by Calder Hall Magnox Reactors would be far more expensive than electricity produced by coal fired plants, but the British government had an answer to that. The real function of the Calder Hall reactors was the production of plutonium for nuclear weapons. Thus the British built a series of Magnox reactors for dual purpose use. In October 1953, less than three months after the Teller letter to Cole, the British tested two devices made from some of the Calder Hall produced plutonium in a South Australian desert. The Totem devices both went off with quite a bang, but some thing about the test displeased the British mightily, for they never went through with their plan to weaponize Calder Hall Plutonium. These events have never been satisfactorily explained. In moderated reactors, if Uranium-238 absorbs a neutron, it is likely to be transformed into plutonium-239 rather than fission. Pu-239 is fissionable, but in moderated reactors 36% of the time Pu-239 undergoes transformation into Pu-240. Pu-249, like U-238 is not fissionable in moderated reactors. Plutonium-240 does have one unusual quality. It undergoes spontaneous fission. Quite a lot of it as a matter of fact. Every pound of Pu-240 will produce something close to 200,000 fission events a second. And each fission event will produce neutrons, that can trigger fission in fissionable isotopes. Unlike U-235 and Pu-239, Pu-240 does not need to absorb a neutron prior to fission, and absorbing a thermal neutron does not trigger fission in a Pu-240 atom, which then becomes Pu-241. Pu-241 is fissionable in a moderated reactor. A moderator is a material that, such as graphite, that decreases the energy level of neutrons. Moderators increase lower the criticality threshold of low enrichment nuclear fuel. With a graphite moderator it is possible to create a chain reaction in natural uranium. Since the first American reactors were built before the United States had the ability to produce enriched uranium, they had to use a moderator to create a chain reaction, and American reactor designers chose graphite. If a Neutron is absorbed by a U-235 atom, most of the time, the U-235 splits, and releases neutrons. If one or more of those neutrons is absorbed by U-235 atoms, we have a chain reaction. If a neutron is absorbed by a U-238 atom in a moderated reactor, the U-238 will undergo a nuclear transformation and become Plutonium-239. Now Pu-239 is fissionable, but it is more fissionable with fast neutrons, In a moderated reactor if a Pu-239 atoms absorbs neutrons, 64% split, and 36% become Pu-240. For weapons designers, Pu-240 is a bad thing. If spontaneously fissioning Pu-240 is mixed with Pu-239, neutrons from the Pu-240, will start to trigger the fission of the Pu-239. If enough Pu-239 is precent, this can trigger a nuclear explosion, although one which might be of far less power than would be expected in an plutonium based nuclear weapon. In nuclear weapons the timing of the beginning of the nuclear explosion is very important. If the trigger goes off too soon, the explosion can loose most of its potential power. If Pu-240 is present in a plutonium based bomb, its neutrons will trigger a premature explosion of a Plutonium based weapon, compromising its military effectiveness. The way weapons designers control this is to limit the mount of Pu-240 in nuclear weapons. Since 36% of Pu-239 will become Pu-240 in a moderated reactor, it is highly desirable to get it out of a moderated reactor almost as quickly as it is created. But power reactors need to be run very differently than weapons production reactors. A power reactor functions best when fuel is kept in the reactor as long as possible. This will produce Plutonium, but a mixed form of Plutonium called Reactor Grade Plutonium. RGP includes Pu-238, Pu-239, Pu-240 and Pu-241. From the weapons viewpoint this is very undesirable. In preparing Calder Hall plutonium for the Totem tests, the British pulled the nuclear fuel from the reactor quickly, and processed it. This lead to mix of about 90% Pu-239 and 10% Pu-240. 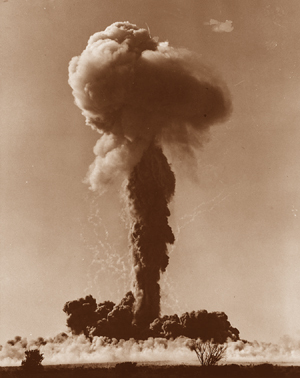 The Totum experiment demonstrated that this a vigorous explosion could be produced with this Plutonium mix, but other results of the experiment proved less than satisfactory, and the British gave up the idea of using plutonium from the Calder Hall reactors to produce nuclear weapons. The United States also ran a nuclear test with Calder Hall plutonium in 1962, probably with even less satisfactory results than the 1953 British experiments. In fact, by the mid 1960's the British thought the Calder Hall reactors were so useless for military purposes, that they declassified their plans, something they never would have done, if they believed that the Calder Hall could produce weapons useful Plutonium. From the 1960's onward increasing amounts of discarded RGP, became available in both the West and in the Soviet Union, as a byproduct of civilian power reactors, yet no nation ever chose to weaponize RGP. Clearly then there are significant disadvantages to the use of RGP for weapons purposes. Some of these disadvantages are understood. Not only is a weapon built from RGP likely to be of limited explosive power, when compared with ordinary nuclear weapons, but heat and radiation from RGP are likely to damage the weapons triggering mechanism. Thus if kept on the shelf for too long, the RGP weapon is likely to disarm itself. How long is too long? it could be a period as short as a few days or even a few hours. In addition there are the problems of building a nuclear weapon from highly radioactive materials like RGP. It is possible for people in places like Los Alamos to design and build nuclear devices using "Reactor Grade Plutonium", and successfully trigger those devices. It does not appear possible to build triggerable nuclear weapons from RGP. Thus self styled academic nuclear experts who speek knowingly of nuclear proliferation using Reactor Grade Plutonium, simply don't know what they are talking about. There is a minor technical error. Even U-235, U-238 and Pu-239 can undergo spontaneous fission. For Pu-240 the shorter half-life(6569 years) and relatively high probability of spontaneous fission per decay(5.0x10-4) combine to give orders of magnitude more neutrons produced from spontaneous fission than U-235 or Pu-239 can produce. Pu-240 contamination of Pu-239 problem was already known to Manhattan project bomb designers in WW2. Originally there were plans to trigger Plutonium bomb with gun type method just like in U-235 type bomb, except that longer barrel was needed. However, after the bomb grade Pu-239 was delivered from Hanford reactor, specifically designed for Pu-239 production, it was found that it was more contaminated with Pu-240 than the sample previously obtained from accelerator, hence it became clear that gun type trigger method would not work due to pre ignition caused by Pu-240. Gun type bomb casings were already made, however, it was all abandoned and implosion trigger method had to be developed to trigger the purest Pu-239 obtainable. Despite this 65 year old knowledge there are still some people today who think that commercial reactor grade plutonium is good bomb making material. It is not the way bomb makers choose to take. Soylent you are correct that U-235, U-238, and Pu-239 sometimes undergo spontaneous fission. it is perhapse more useful to say that the spontaneous fission of those isotopes does not create a problem for fission device design, while the spontaneous fission of Pu-240 does.